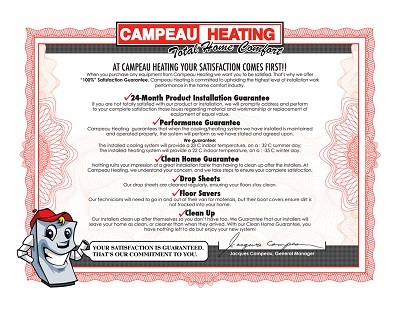 At Campeau Heating Your Satisfaction Comes First!! When you purchase any equipment from Campeau Heating, we want you to be satisfied. That's why we offer a 100% Satisfaction Guarantee. 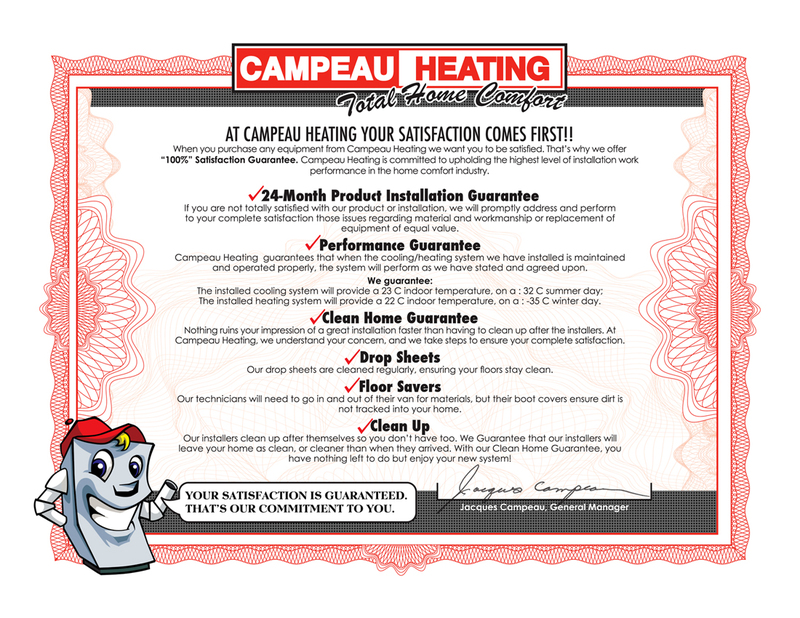 Campeau Heating is committed to upholding the highest level of installation work performance in the home comfort industry. If you are not totally satisfied with our product or installation, we will promptly address and perform to your complete satisfaction those issues regarding materials or workmanship, or replacement of equipment of equal value. Campeau Heating guarantees that when the cooling/heating system is maintained and operated properly, the system will perform as we have stated and agreed upon. The installed cooling system will provide a 23C indoor temperature on a 32C summer day. The installed heating system will provide a 22C indoor temperature on a -35C winter day. Nothing ruins your impression of a great installation faster than having to clean up after the installers. At Campeau Heating we understand your concern, and we take steps to ensure your complete satisfaction. Our drop sheets are cleaned regularly, ensuring your floors stay clean. Our technicians will need to go in and out of their van for materials, but their boot covers ensure dirt is not tracked into your home. Our installers clean up after themselves so you don't have to. We guarantee that our installers will leave your home as clean, or cleaner, then when they arrived. With our Clean Home Guarantee, you have nothing left to do but enjoy your new system.